Figure 1. HeLa cells were seeded at varying density in a 96-well plate and incubated overnight. The Resazurin solution (10% of cell culture volume) was added to the plate and relative fluorescent units were measured at 0, 1, 2, 4, and 6 hr. Figure 2. Jurkat cells were seeded at 1x105 cells/well in a 96-well plate and then treated overnight with various concentrations of astemizole or terfenadine. Cytotoxicity was measured using the Resazurin Cell Viability Kit (left), followed by BrdU Cell Proliferation Assay Kit #6813 (right). 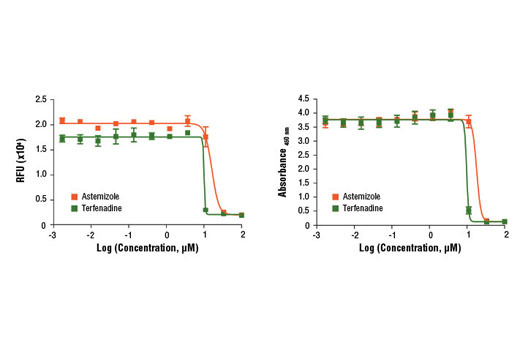 The Resazurin Cell Viability Kit is a fluorescent assay that detects cellular metabolic activity. The blue nonfluorescent resazurin reagent is reduced to highly fluorescent resorufin by dehydrogenase enzymes in metabolically active cells. This conversion only occurs in viable cells and thus, the amount of resorufin produced is proportional to the number of viable cells in the sample. The resorufin formed in the assay can be quantified by measuring the relative fluorescence units (RFU) using a fluorometer (Ex=530-570 nm, Em=590-620 nm). Store at -20°C. Note: Resazurin solution should be stored at -20°C in the dark for long term storage. It can be stored at 4°C in the dark for up to 12 months. Cell viability assays are widely used in drug discovery for the study of growth factors, cytokines, and cytotoxic agents. High throughput screening, in both early drug discovery compound screening and subsequent drug safety and toxicity studies, require reliable, sensitive, and simple assays with the ability to analyze a large number of samples. Colorimetric cell viability assays using tetrazolium salt, such as MTT, XTT, and WST-1, were developed based on live cell reduction of tetrazolium salt into highly colored formazan compounds (1,2). Similarly, resazurin (blue and nonfluorescent) can be reduced to resorufin (pink and highly fluorescent) in live cells and is therefore used to assess mammalian cell toxicity, viability, migration, and invasion (3-6). 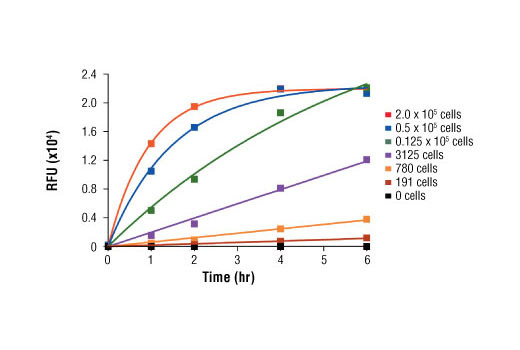 Similar to the XTT Cell Viability Kit #9095, the Resazurin Cell Viability Kit does not require radioactive materials, cell fixation, or cell permeabilization, and cells used in this assay may be used for further analysis. Scudiero, D.A. et al. (1988) Cancer Res 48, 4827-33. Roehm, N.W. et al. (1991) J Immunol Methods 142, 257-65. Nakayama, G.R. et al. (1997) J Immunol Methods 204, 205-8. Al-Nasiry, S. et al. (2007) Hum Reprod 22, 1304-9. Anoopkumar-Dukie, S. et al. (2005) Br J Radiol 78, 945-7. O'Brien, J. et al. (2000) Eur J Biochem 267, 5421-6.